The Multi-terrain Monitor displays the vehicle surroundings when driving at low speeds, thus assisting off-road driving and helping the driver to check the vehicle surroundings. 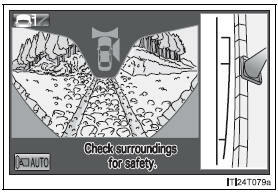 By referring to the guidelines shown on the front monitor screen, you can decide a driving line while assessing the distance to obstacles ahead of the vehicle and confirm the projected path, and by using the wide view front & side monitors, the side-front simultaneous display monitor and the side-rear simultaneous display monitor to identify objects in the vicinity or course of the tires, you can drive while preventing the vehicle from becoming stuck unexpectedly. Normal display mode: Press the VIEW switch to display the screen. Automatic display mode: The screen is displayed automatically. 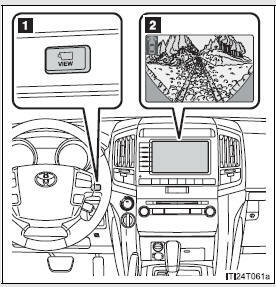 If the shift lever is shifted to “R”, the rear monitor (Toyota parking assist monitor) will be displayed, and the screen will switch every time the VIEW switch is pressed. In this mode, the screen is switched automatically in response to vehicle speed and shift lever operation, in addition to screen switching by operating the VIEW switch. Touch “AUTO” on the front or wide view front & side monitor screen. The “AUTO” indicator will come on. Touch “AUTO” again to return to normal display mode. The illustration shown here is an example. As such, the actual visible area may be different. See P. 272 for information about the visual range of each camera. The image from the front camera is displayed. Use this monitor to help check the area in front of the vehicle for safety. 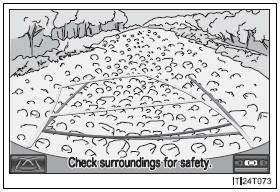 Guidelines are shown to help determine the course. Images from the front and the sides of the vehicle are displayed. This display is used to verify the situation at crossings with poor visibility, and to assist with safety confirmation when turning right. 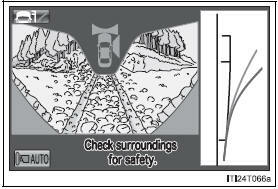 Guidelines can also be displayed as a steering guide when turning right. The image from both side cameras is displayed. 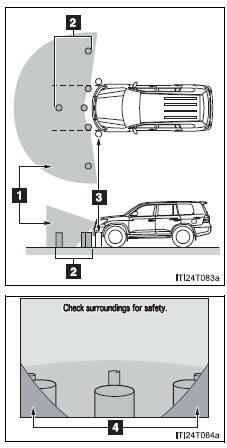 Use this monitor to help check the area on both sides of the vehicle at the same time, and to check for objects near the tires or the sides of the vehicle. 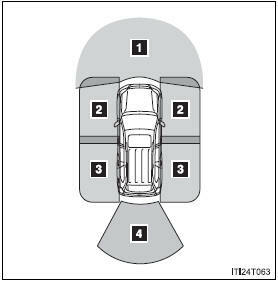 Guidelines showing an image of the vehicle width and the position of the rear tires are displayed. The image from the rear camera is displayed. 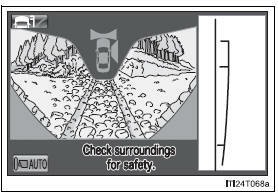 For information regarding the Toyota parking assist monitor, refer to “Navigation System Owner’s Manual”. Displays the image being shown by the front monitor. Indicates the outer path of the tire. Indicates the inner path of the tire. Shows the position about 3.3 ft.
(1 m) away from the front edge of the vehicle. Shows the position about 1.6 ft.
(0.5 m) away from the front edge of the vehicle. The trajectory lines move according to the steering wheel position. 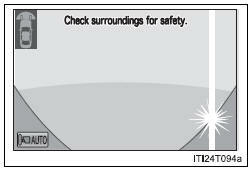 *:While the Turn Assist function of Crawl Control is operating, the trajectory lines will be displayed as dotted lines. At this time, there may be a difference between the trajectory lines and the actual course of progression. The course line display mode will change as follows each time the switch is touched. When the shift lever is in “R”, display mode can not be changed. Shows the position of the vehicle’s front tire. Shows the position of the vehicle’s leading edge. 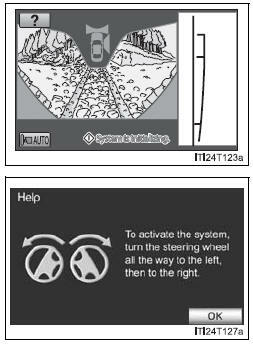 Displays a rough guide of the vehicle path that moves according to the steering wheel position. Displayed along with the minimum projected turning circle. Displays the smallest turning circle projected by the system if the steering wheel is turned to full lock. Displayed when the steering wheel is turned to the right (further than 90° from straight ahead). Indicates the width of the vehicle including the outside rear view mirror. Shows the position of the vehicle’s rear tire. Displays the image being shown by the side-front simultaneous display monitor. Shows the position of the vehicle’s front edge. 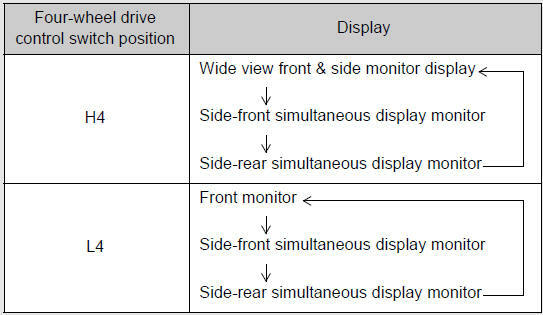 Displays the image being shown by the side-rear simultaneous display monitor. Shows the position of the vehicle’s rear edge. Refer to “Navigation System Owner’s Manual”. The minimum projected turning circle line is added to the no course lines mode. 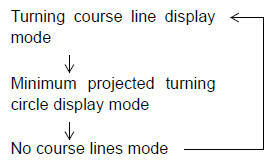 The projected course line is added to the minimum projected turning circle mode. 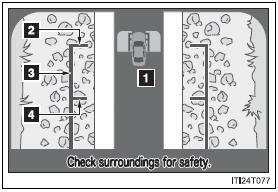 Use the vehicle width line to check the vehicle’s distance from objects such as curbstones etc. 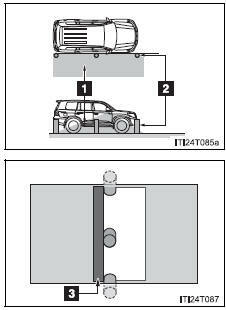 As shown in the illustration, be sure that the vehicle width line does not overlap the object. If you also move the vehicle so that the vehicle width line and the object are parallel, you can park parallel to the object. 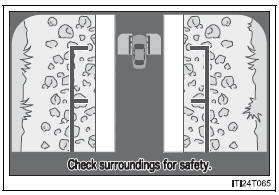 Use the minimum projected turning circle & projected course line (when displayed) to check the vehicle’s path with relation to obstacles. If the minimum projected turning circle line (blue) is over the obstacle as shown in the illustration, or the obstacle falls within the minimum projected turning circle, if you turn with the minimum possible turning circle, the vehicle may collide with the object. 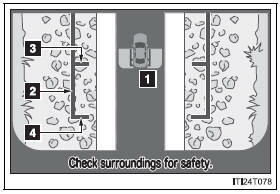 When the projected course line (yellow) is displayed, be sure to operate the steering wheel so that the obstacle stays outside the projected course line until the vehicle has passed the object. The vehicle speed is less than approximately 7 mph (12 km/h). In the following situations, the image is canceled automatically. When the vehicle speed exceeds approximately 7 mph (12 km/h). After the vehicle speed exceeds approximately 7 mph (12 km/h), the image will continue to be displayed for a short time. If the vehicle speed returns to below 7 mph (12 km/h) before the image extinguishes, the image will continue to be displayed. An interruption screen is displayed when an obstacle is within the detection range of the intuitive parking assist. When the door mirrors are folded. The screen will be turned off temporarily while the door mirrors are folding, and the screen will return to normal once folding has been completed. The area covered by the camera is limited. Objects which are close to either corner of the bumper or under the bumper cannot be seen on the screen. 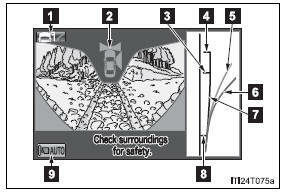 The area displayed on the screen may vary depending on vehicle orientation or road conditions. The vehicle is in a dark area, such as at night. The temperature near the lens is extremely high or low. Water droplets are on the camera lens or humidity is high, such as when it rains. Foreign matter, such as snow and mud, adheres to the camera lens. The camera has scratches or dirt on it. The sun or headlights are shining directly into the camera lens. The camera lens is damaged by flying stones. If a bright light, such as sunlight reflected off the vehicle body, is picked up by the camera, a smear effect* characteristic to the camera may occur. *: Smear effect - A phenomenon that occurs when a bright light is picked up by the camera; when transmitted by the camera, the light source will appear to have streaks of light emanating from it. The streaks will also appear when the light source is in the vehicle icon area. When the camera is used under fluorescent lights, sodium lights, mercury lights etc., the lights and the illuminated areas may appear to flicker. The battery has been reinstalled. The steering wheel has been moved while the battery was being reinstalled. The steering sensor has been reinstalled. There is a malfunction in the signals being output by the steering sensor. Drive for a short period of time while keeping the steering wheel straight. Stop the vehicle, and turn the steering wheel as far as it will go to the left and right. On the system initialization screen, touch the “?” button to display the operating procedure. If this does not resolve the symptom, have the vehicle inspected by your Toyota dealer. Never depend solely on the monitor system. 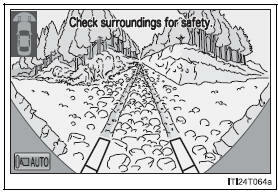 Always check visually and with the mirrors to confirm your intended path is clear. Depicted distances between objects and flat surfaces differ from actual distances. Do not use the system if the hood or doors are open. 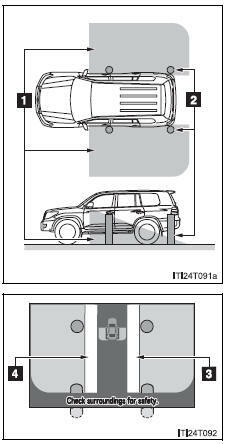 If the front or the rear of the vehicle or the outside rear view mirror has been hit, the camera’s position and mounting angle may have changed. Have the vehicle inspected by your Toyota dealer. Rapid temperature changes, such as when hot water is poured on the vehicle in cold weather, may cause the system to function abnormally. If the camera lens is dirty, it cannot transmit a clear image. Rinse with water and wipe with a soft cloth. If the camera lens is extremely dirty, wash with a mild cleanser and rinse. Do not strongly rub the camera lens. If the camera lens is scratched, it cannot transmit a clear image. Do not allow organic solvent, car wax, window cleaner or glass coat to adhere to the camera. If this happens, wipe it off as soon as possible. The displayed image may be darker and moving images may be slightly distorted when the system is cold. 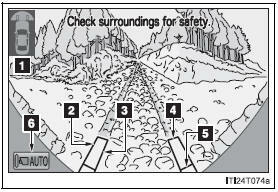 If the tires are changed, the position of the guide lines displayed on the screen may be incorrect. When changing the tires, consult your Toyota dealer. Depending on the circumstances of the vehicle (number of passengers, amount of luggage, etc. ), the position of the guide lines displayed on the screen may change. 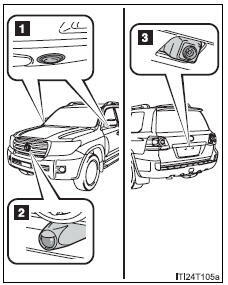 Be sure to check visually behind and all around the vehicle before proceeding. 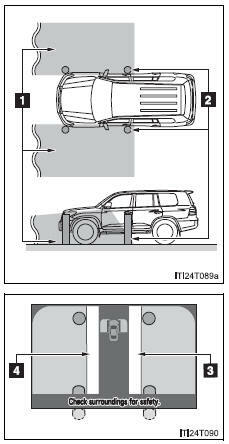 Depending on the overall length of the vehicle (if a frontal protection system is installed or the bumper has been replaced, etc. 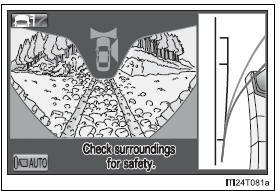 ), the position of the distance guidelines displayed on the front monitor may change. 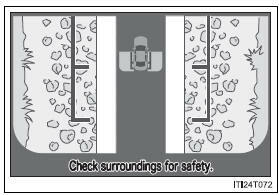 Be sure to check visually behind and all around the vehicle before proceeding. When washing the vehicle, do not apply intensive bursts of water to the camera or camera area. Doing so may result in the camera malfunctioning. 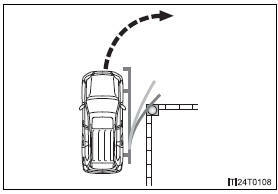 Even if an obstacle is no longer visible on the side monitor, do not turn the steering wheel further in the direction the vehicle is turning until the vehicle has moved completely past the obstacle. If the steering wheel is turned to full lock, the vehicle will turn in the smallest possible turning circle, and may collide with the obstacle. It may be difficult to judge distance with the image from the front camera due to the characteristics of the lens. Drive carefully while checking the actual distance to the obstacles displayed on the screen. Also, give your full attention to sudden bumps in the road.